The system is completely modular, and the anodized aluminium looks elegant in any setting. FLEX-display™ offers various options for assembling displays and they can be adapted to the size and material of any type of print for indoor use. Totem displays are a flexible way to put up triangular or square displays. The base is foldable and easy to transport. Telescopic poles make it easy to suspend the banners perfectly on three or four sides. You also have the option of hanging Totem displays from the ceiling. No base and no vertical poles are necessary – just banners mounted on horizontal bars with corner clips. This system can also be fitted with a battery motor to add movement and attract even more attention. Above, some examples of Totem displays used both free-standing and ceiling mounted. they attract attention in a shopping centre – but are still lightweight and easy to move whenever it is necessary. This is a new version of FLEX-display framing the banner. It gives a balanced and elegant impression with slim telescopic aluminium poles on two sides of the banner. It was developed especially for double-sided banners - but it also looks great with regular banners. 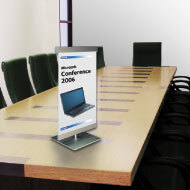 FLEX-display™ Frame is available with a foldable or an aluminium plate base. Put your display on a counter, a desk or in a shop or showroom window. The tabletop base is a superb solution when you need a smaller display that fits in anywhere.